Click here to watch if you can't see the video above. If you'd like to subscribe to my Youtube Channel (it would make my week), please click here. So what is the T3 Twirl 360? 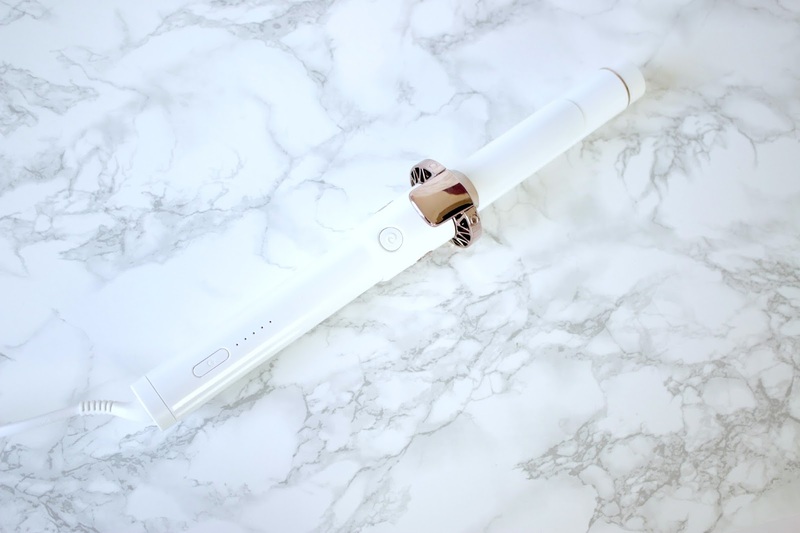 It's a new one-of-a-kind gyroscopic styling iron, and isn't it pretty with the white and rose gold? What makes it unique is that with a twist of the wrist and a button click, the barrel rotates for you, making styling and curling hair faster and easier than ever. The Tourmaline Technology fights frizz and seals the hair cuticle. It has 5 heat settings (up to 410) and features motion-sensing technology. 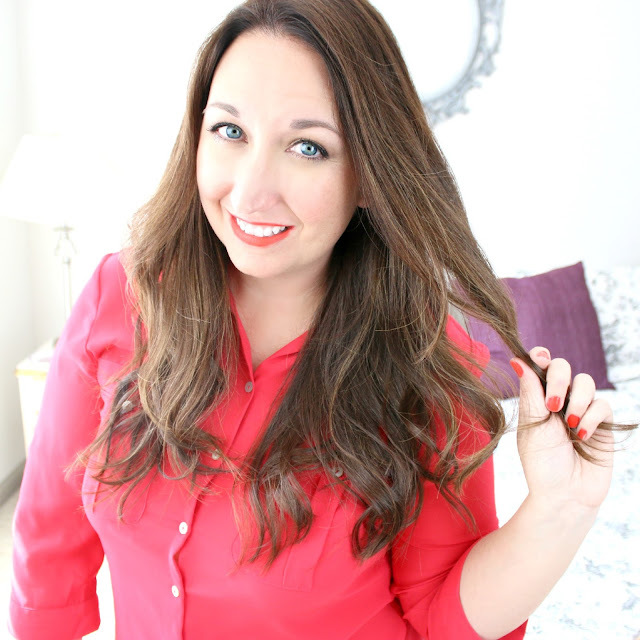 I cannot recommend this gorgeous styling iron enough! To use it, plug in and simply choose your heat setting. In a few seconds, choose a section of hair and slide the curling iron down to the end (pictured). Slightly twist your wrist and click the button to activate the twirling motion (pictured). Let go of the button when you have reached your roots or where you'd like the curl to begin. Leave in about 5-10 seconds. I usually do 10. You can open the clamp to release hair or double click the button to rotate the barrel in the opposite direction (pictured). You hair won't get stuck or sucked into a machine, because you control it with the click of a button. It is so easy, I swear! As for the tutorial, take sections of hair, around half an inch, and curl them, holding each section for around 10 seconds. Once the curls have curled, gently mess them up with your fingers. Finish with hairspray if desired. Last chance to enter to win $100 Visa Giftcard! I extended the deadline for my $100 Sephora giveaway (see reason below). It's not too late to enter! Yesterday marked 2 months since my Daddy passed away. Saturday would have been his 60th birthday. We are celebrating his life and fulfilling his final wishes. Please keep me in your prayers and thoughts this weekend. Love y'all! EDIT: As of 11-7-15, this model is being recalled. Luckily this tutorial will work with any curling iron. Great demo! Such beautiful curls! If only my hair were long enough lol. Also, I subscribed to your channel. I didn't even know you had one! What a great little tool! I always die over Kate's hair, I just need her stylist to permanently live with me haha! Happy Friday! 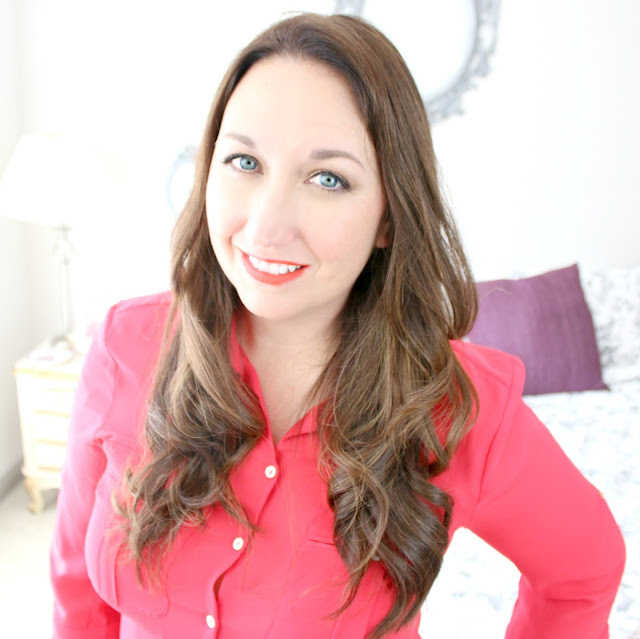 The styling iron looks gorgeous and SO easy to use! I hope you and your family celebrate your daddy's life to the fullest this weekend! How easy! I love the self twirling action. And it turned out so pretty on you! I liked this tutorial very much! Your hair is always beautiful, and with these curls it's so chic! I loved it and this device - it's new to me! The curls are lovely, but what I really love is the fact that it fights frizz and seals the hair cuticle -frizz is my hell. Ok, not so bad, but it annoys me, so I find this technology great! Kate's hair always looks flawless. This is such a fab how-to, Elle! I love it!!! You got them spot on! The curls look lovely on u.. so far I have never tried any styling tool for my hair !! gahhh your hair is amazing! totally looks like Kate's hair. spot on, great tutorial! I am going to try it, but it will have to be with my cheapo normal curling iron lol. that tool looks fabulous, but ouch price tag!! I love Kate's hair and your hair looks amazing too! I'm not very good with a curling wand but will try this! Thanks for sharing your tutorial! Thank you for this!! I have a curling iron and really have no idea how to use it properly so this tutorial is great!! Thanks for sharing! I so need to get a curling iron. So I can do this to my hair. Have a great weekend. Great demo and have a great weekend! Your hair always looks great, Elle! Oh Lordy... that scares me... I just see me clicking it the wrong direction & totally getting stuck in it for life. I'll be thinking of you and your family tomorrow Elle, I know that won't be an easy day. I love how soft and pretty those curls look, I'm definitely intrigued by this tool! I love Kate so much. She always look perfect. You pulled it off really well!! 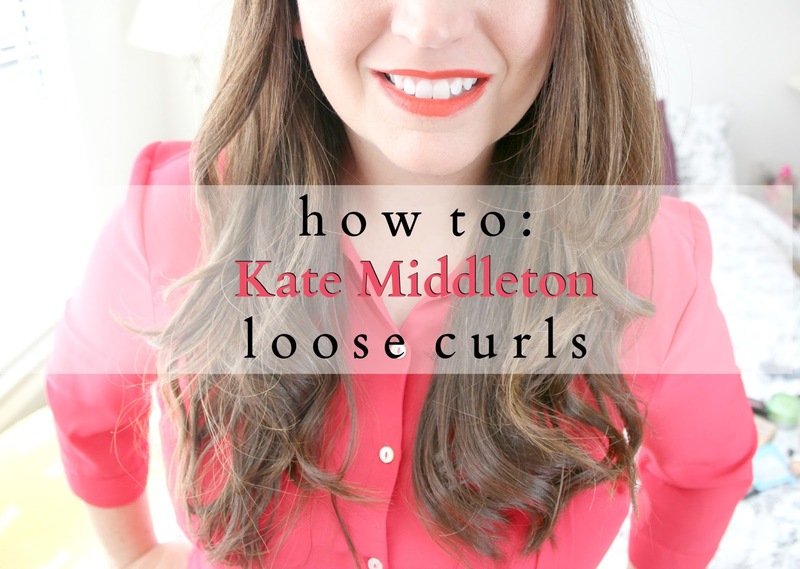 My obsession with Kate Middleton is so real so I LOVE this tutorial. My hair is super thick so I don't keep it long, but I would kill for hair like hers (and yours!). Enjoy your weekend! I love Kate's hair! Great tutorial! How cool is this iron?! And I agree I think that's the prettiest iron I've ever seen! I hope you have a great weekend! I can't wait for my hair to grow long again so I can curl. That's such a cool wand - I've never used one that does the twisting for you! I love that look. Kate Middleton is seriously one of my style icons, I just love how classy she always looks and her hair is gorgeous all of the time. I love how that curling iron just sort of does the hard part for you! And it looks so pretty too. You did such a good job with your hair and the tutorial! Love the look. The curls came out fabulous! Thinking of you, hope you are ok.
Keeping you in my thoughts and prayers this weekend. Great tutorial - your curls look just lovely!! I love this look. Thanks for the tutorial. Just entered to win one of the babies! Maybe I just don't get out much to see new technology but this is the coolest thing I've seen in a long time. It pretty much does all the work for you! And your hair looks gorgeous! Really does look like Kate Middleton's. Sometimes you see stuff like this and it's a stretch but you hit the nail on the head!